My favorite in Kannada cuisine. It is a rice-based breakfast item, very similar to dosa. I love it for its mix of soft and crisp textures and the use of flavorful jeera, dill (a kind of herb that belongs to the parsley family), and coriander leaves. 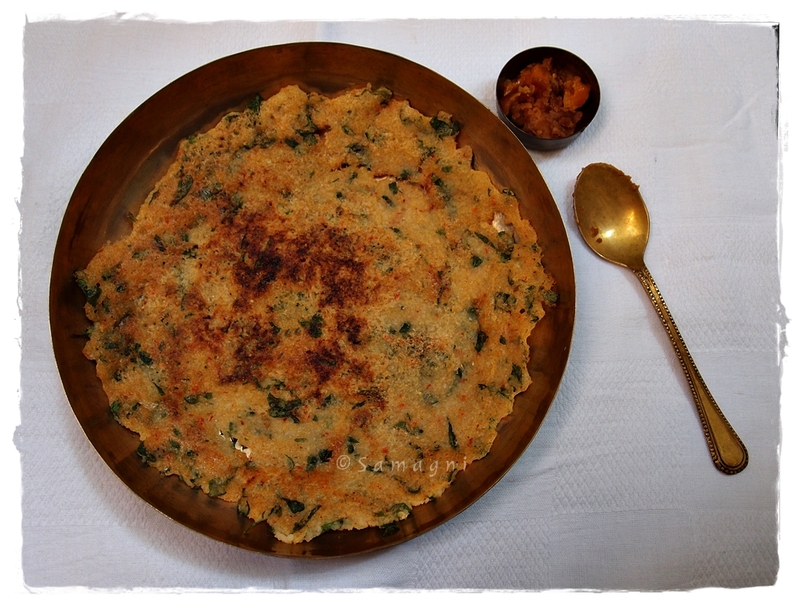 Akki roti means rice pancake in Kannada. It is made by mixing boiling water in rice flour along with salt and kneaded well to make a soft dough. Chopped onions, crushed cumin seeds, coriander leaves, dill leaves, and curry leaves can be added while kneading the dough. Due to the sticky nature and thick consistency of the rice dough, instead of directly spreading it on to the tawa, it needs to be spread out on a banana leaf. At roadside stalls, I have seen thick aluminum foil/plastic sheets being used. I would not recommend this. Try to use banana leaf. Akki roti is best served hot and can be eaten along with sambar and/or chutney. A dash of butter or ghee with akki roti is also preferred. Boil water in a pan. When the water starts boiling, reduce the heat, add rice flour and salt into the pan a bowl. Mix the flour using a ladle until it becomes a smooth and firm round ball (similar to chapathi dough). Keep aside. Chop onion finely. Crush jeera (this helps bring out the flavor). Clean and wash dill leaves, coriander leaves, and curry leaves and chop them finely. Slit the green chilies, remove the seeds, and chop finely. Add the chopped ingredients into the dough and mix well. Wash banana leaf, wipe with a dry cloth, and smear oil on the dark green side. Take fistful of dough and make into a round ball. Place the round ball of dough on the banana leaf where the oil is smeared. Flatten the ball with your hands – in this case, wet your fingers with oil/water periodically to prevent the dough from sticking to them. Alternatively, you could place the dough between two well-oiled banana leaves and use a rolling pin to spread it. Before cooking, take off the banana leaf at the top. The spread out dough can have the thickness of a roti. Heat an iron tawa and use an oil smeared cloth to smooth out the surface. Place the banana leaf on it, dough-side down. After a minute or so, when the leaf starts fading in color, carefully peel off the leaf. If you are using a plastic sheet, make sure the sheet doesn’t touch the tawa. Drizzle a tsp of oil and cook the roti on medium flame on both sides. Roll out the remaining dough and cook in a similar fashion. Serve with coconut chutney and/or Sambar. 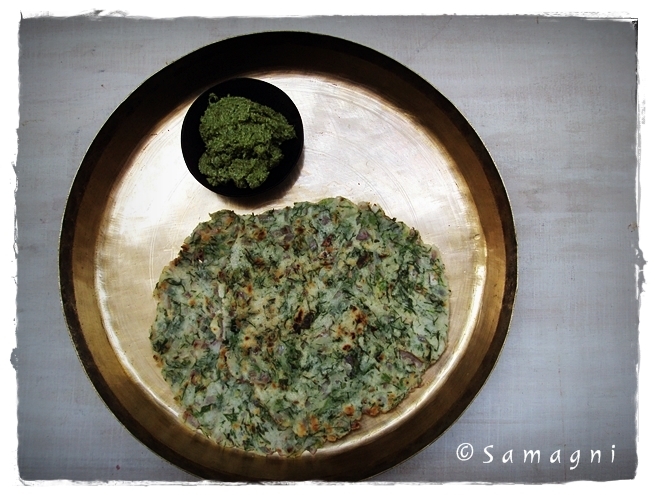 One part of a banana leaf can be used to make 4-5 akki roti. An alternative and easy way of making akki roti (more like a dosa) is to use normal water instead of boiling water and make the batter dilute as in a rava dosa/neer dosa batter. In this case, you need to use a ladle to pour and spread the dosa batter on the tawa. It would be ideal to close the dosa with a lid after the batter is spread out. Flip over after a minute and cook both sides. This method can be tried out when banana leaf is not available. The dosas made this way are thinner and retain softness for a longer time unlike akki roti, which is best eaten fresh. The texture and taste of akki roti is unique when made in the traditional way, and I highly recommend trying it out. Before mixing water to the rice flour, add a 1 tsp of hot oil. Mix it in and then add water. This reduces the chewiness of the roasted roti. You can also add roasted and coarsely ground peanuts to add some texture to the roti. If you prefer some sourness, you can add some sour curd to the dough. You can substitute rice with ragi and make ragi roti. Ragi is rich in calcium, fiber, protein, iron and other minerals and hence a healthier choice than rice. Instead of using rice flour, you can soak raw rice in water for 3-4 hours, grind it to a fine paste and make the roti. Turns out delicious and stays soft for long. The advantage of making akki roti from scratch is that you get to choose the type of rice and can use red rice or unpolished rice varieties for more nutrition.